By the first of July 1862, Private William C. Cherry had become a combat veteran. He and his brother James Albert Cherry – who had enlisted with him — had fought in the first battle of the Seven Days’ Campaign before Richmond. Those battles proved the fighting spirit of the Army of Northern Virginia. General Robert E. Lee had reorganized and renamed the army when he replaced the wounded General Joseph E. Johnston. We know something of William Cherry’s part in the campaigns through a memoir he wrote after the war. The family knew William Cherry as “Crab” and James as “Judge.” Their company – the West Point Guards – formed part of A. R. Wright’s Georgia Brigade. During the fall of that year, I remember visiting the famous dry dock at Portsmouth, and I walked through the famous ship Merrimac when it was being converted into a ram. And afterwards, I witnessed the great naval battle in the Hampton Roads between the Merrimac on one side and the Cumberland, Congress, and Ericson on the other side. This is said to be the greatest naval battle ever fought on American waters. I witnessed it all from beginning to end, and was only a few miles away from it, and had the use of a good spy glass. I saw the Congress sink and the drowning men climb up on the ship’s rigging. I witnessed during the entire day the firing of the guns and the maneuvers of each ship. But in May 1862, Federal troops landed on Virginia’s Peninsula, which lies between the James and York rivers. Norfolk, Virginia – the major port of Virginia on the Atlantic – fell to the Union. The Union army drove the Confederates out of Williamsburg, the old Colonial capitol, and laid siege to Richmond, now the Confederate capitol. 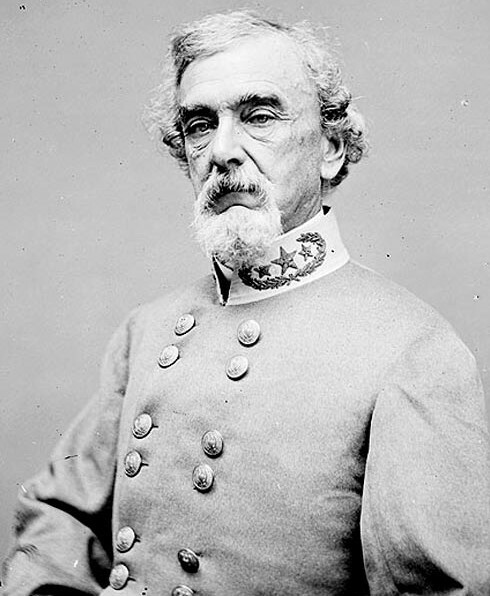 Wright’s brigade marched to Richmond to join the main Confederate army. On May 31, enemy fire severely wounded the commanding general of the Confederate army. On June 1, General Lee took over. Lee planned an offensive to break the siege of Richmond. [W]e entrenched ourselves in front of [the Union army’s commander, General George] McClellan, four miles from Richmond on the Williamsburg Road. About the first of July, ‘62 (actually June 28), I participated in my first battle with our company, which was known to us as “King’s School House.” Several of my friends of the company were killed there, and two of my comrades on each side of me fell pierced by bullets. The Williamsburg Road today heads east away from the Richmond airport. The battle has several names, including the Battle of Oak Grove. It was the first battle of the campaign of the Seven Days, which drove McClellan away from Richmond. The 4th Georgia formed part of a division commanded by General Benjamin Huger (pronounced “ooh-ZHAY” ). There were many thrilling incidents that happened to me there, one of which turned out to be comical. I captured as a prisoner of war a real fine-looking, well-dressed officer on the battlefield and took from him his sword and stuck it under a brush heap, intending at a future time to get it. And I made the prisoner go to the rear. The next day, though, what I thought was a prisoner of war turned out to be an officer on our side. He said he had been captured by the Yankees just before that and was glad I recaptured him. So we went to the place and took his sword out of the brush heap, very much to my gratification, and his, too. Another incident was that at a certain time during the battle, we ran into a regiment of the enemy to their surprise. Some ran and hid away, but one of them, a tall man, turned around near me, leveled his gun deliberately at me, and fired – which of course missed me, as I was so near if it had hit me it certainly would killed me. All this time, I was loading mine, which I had discharged at some of them before this occurred. Thus began twenty-four months of campaigning under Robert E. Lee.